Are you having issues setting up a server? Go ahead and order from our partner SurvivalServers.com they have everything up and running. 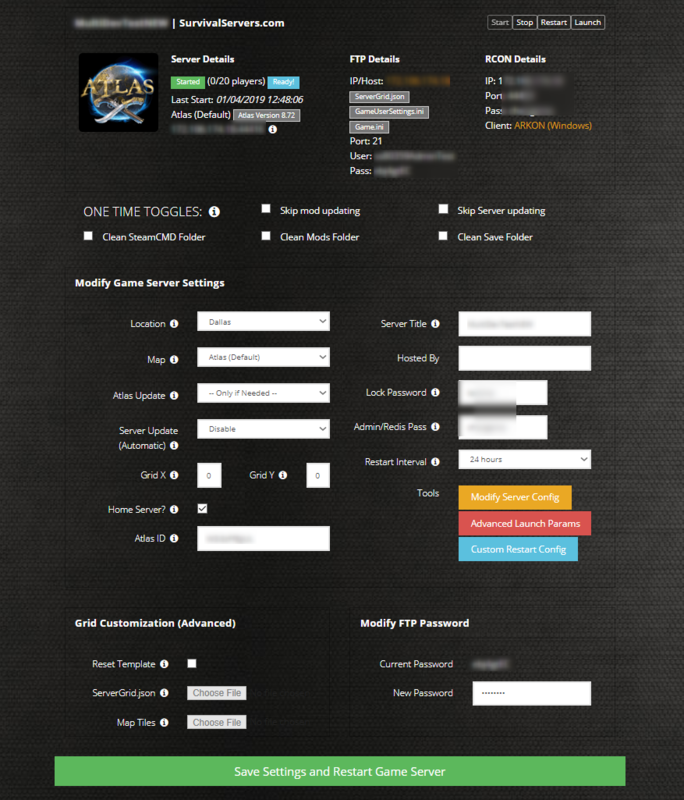 Here's a quick peek at their control panel which has lots of customization options for your Atlas server! You can even create your own Atlas grid up to 4x4 with 16 servers! So you are the do-it-yourselfer type, eh? Follow along below! Hey folks.. I am making using of this fan created community forum to post my way of how to create my own locally hosted (ON YOUR PC) server that everyone can join. The best method to get game server dedicated hosting files is via SteamCMD. You should create this in the Folder mentioned above! Make sure that you open the ports 44015, 44016, 44017, 44018 on both your router and your Windows Firewall! With this, the Server is running. It will take a few MINUTES for it to be fully registered with the Atlas master server to show up in the Server Lists. Open up your main Steam window and open the upper left tab called "View". There should be a point called "Server" which opens the good old server browser from Steam. Go to "LAN" and select Atlas as a Game in the lower left filter. Refresh the List until you see your Server, this can take some time. I tested things like "cheat god" or "cheat fly" and they are working. How to update my SteamCMD Server after Atlas was updated? Could even take more time. The Server needs time to register with the Master Server from Atlas. in your startup string. I followed the info, but I just get a crash when it tries to launch. Same problem for me, "Windows cannot find 'ShooterGameServer.exe'. Make sure you typed the name correctly and then try again." Is what keep's popping up. I got the same error of not finding "shootgameserver.exe" so I put the batch file in the same dir as the .exe file, (D:\server\ShooterGame\Binaries\Win64) (start "" /NORMAL "ShooterGameServer.exe") and it ran. However, now I get what looks like an engine error now, and I can not figure this out..